As the world celebrates Press Freedom today, a Kaduna-based non-governmental organization, Africa Media Development Foundation (AMDF) has called on Nigerian practising journalists to be steadfast in their profession without fear or favour from any quarters. The Foundation also urged the media to get their facts and figures right before going to the press in partial fulfilment of ethics of the professiin in the interest of theirselves, profession and the public. Addressing newsmen in Kaduna, Northwest Nigeria on Wednesday, AMDF Coordinator, Sekyen Dadik said, as a day of reflection among media professionals about issues of press freedom and professional ethics, journalists should not felt been threatened or intimidated, but to ensure the highest standard of professionalism in carrying out their mandate. According to her, “Africa Media Development Foundation joins the media and journalists all over the world to celebrate the World Press Freedom Day, 2017. “This year’s global theme: Critical Minds for Critical Times: Media’s role in advancing peaceful, just and inclusive societies reminds us as journalists of our roles in advancing a peaceful and inclusive society in the wake of increasing attacks and impunity against journalists. “As a day to encourage and develop initiatives in favor of press freedom and to assess the state of press freedom worldwide, AMDF reiterates its commitment to promote press freedom and freedom of expression in Nigeria and beyond”. Foundation coordinator who took her tme to take the oarticipants down the memory lane reminded them that, “World Press Freedom Day was proclaimed by the UN General Assembly in 1993 following a recommendation adopted at the twenty-sixth session of UNESCO’s General Conference in 1991 in response to a call by African journalists who in 1991 produced the landmark Windhoek Declaration on media pluralism and independence. “UNESCO notes that the day serves as an occasion to inform citizens of violations of press freedom – a reminder that in dozens of countries around the world, publications are censored, fined, suspended and closed down, while journalists, editors and publishers are harassed, attacked, detained and even murdered”. Commenting on some of challenges facing media practitioners in Nigeria she noted that, journalists and bloggers in Nigeria are no longer at ease to publish reports perceived to be unfriendly by those in power especially, stories on politics, terrorism among others which has led to some of them been recalled from their beats or jobs. “It is rather unfortunate that in Kaduna state North West Nigeria alone, over 5 five journalists have been arrested in less than two years on different charges but all geared towards shutting down the press. “As a day of support for media which are targets for the restraint, or abolition, of press freedom; we call on the general public to rise up and join the media in crying out against every attempt to gag the press which is the hope of the voiceless. 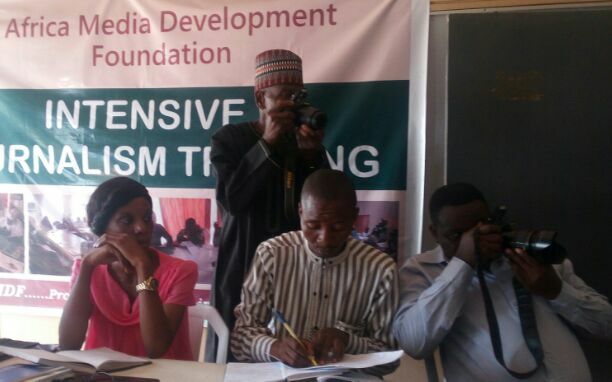 “As we use this opportunity to remember those journalists who lost their lives in the pursuit of a story, and stand also with those who are in court for one story or the other; AMDF calls on the government at all levels, especially Kaduna state to consciously create space for press freedom and freedom of expression as no government will achieve meaningful development by gagging the press and limiting freedom of expression. “We enjoin them to see the press as partners in development not as enemies that must be put down, as such open up for criticisms and see it as an opportunity to meet the yearnings of their followers. “AMDF also appeals to development partners and the civil society to lend their voices in speaking and calling for action against every attempt to muzzle the freedom of expression”, she concluded.